Where the flat tundra gave way to the western range of the Qal Sisma, hills rose like the jagged teeth of a monstrously large dragon sprouting from the hard ground. Amid the hills stood a stone spire twisted into a massive coil. Beside it, an eerie blue-green light drifted like haze from a cleft that split the earth. Here, at the gateway to Ugin's grave, Grandmother halted their party with a raised hand rather than speech. The fissure dove deep to create a vast canyon cut through ice and rock. 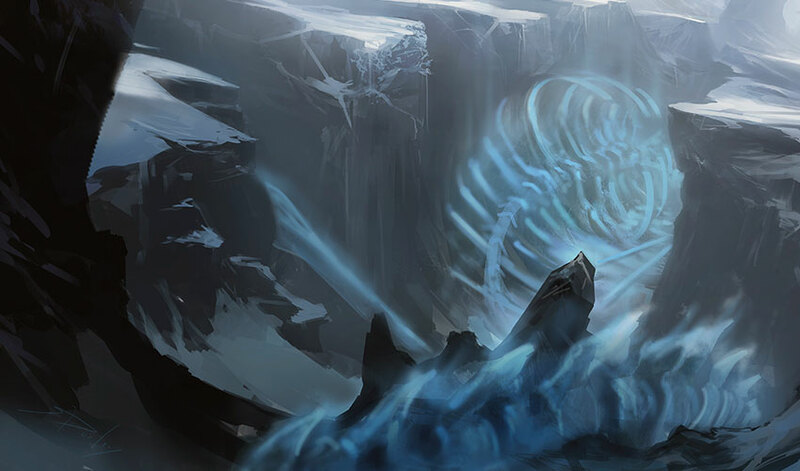 What lay at the base of the canyon was concealed by a huge cocoon of spiky rocks dusted with snow and decorated with crackling lines of ice that traced unfathomable runes woven into its surface. From where they stood on an overlook, there was no way down into the canyon, although a dusty trail kept going out of sight around the rocky ground that bordered the chasm. Naiva remembered the journey to Ugin's grave six years ago, the trek across the tundra, trapping birds and hunting a herd of saiga, and how they'd reached the cleft. After gaping in awe at the strange formation they had walked on the narrow trail along the canyon's rim to a shallow cave. There, they had camped for ten nights. Grandmother called with a ptarmigan's croak, then listened. As they waited for an answer, Naiva shifted nervously. The glow disturbed her almost as much as the sight of the rock cocoon grown along the depths of the chasm. Were the growths bigger than they had been six years ago? Were there more of the mysterious runes? "What are those?" Tae Jin whispered. "Grandmother calls them hedrons. They protect the Spirit Dragon's bones." "Ah. What are we waiting for?" "There's a cave ahead. A hunting party sometimes camps here." "The hunting is particularly good here because dragons avoid this area. And we have to guard against incursions from the Ojutai and Kolaghan tribes. They'd hunt here too, if they could, stealing the game from our territory." "I meant, why are we waiting instead of going on?" "To let them know we're coming. We don't want to surprise them." Tae Jin stared down into the chasm and the shimmering surface of the hedrons. They were opaque; impossible to see if bones lay beneath them, as Grandmother claimed. A curve in the canyon wall hid the rest of the cocoon. "I had no idea the Spirit Dragon was so huge," Tae Jin whispered. "I thought he was the same size as the dragonlords." "No, he was the greatest of the dragons, as of course he must be, since he is the progenitor of all of Tarkir," broke in Baishya. She stood on Tae Jin's other side, shading her eyes with a hand as she studied the hedrons with a slight, mysterious smile. A thought stabbed in Naiva's head: how annoying that Baishya must show off her knowledge when it was Naiva who had shown interest in the young ghostfire warrior first. Her twin already commanded more of Grandmother's attention. Couldn't she leave Naiva with anything? A shrill sound broke up the path of her thoughts: grandmother whistling a louder call. "Mevra is leader of the group who came here last season. Even if they are off hunting, they usually leave a few people at the encampment to cure hides and such work." Grandmother gestured to Fec. "You go up the path to the cave. Mattak, you, Oiyan, Rakhan, and Sorya stay here to guard Tae Jin." "Do you think this has been an Ojutai trap all along?" Mattak asked, glowering at Tae Jin. Grandmother's stern gaze settled on the young man. "It might be. I want you to guard Tae Jin from attack by any of his Ojutai brethren who may have been tasked to follow and kill him. Take cover in the rocks. Girls, with me." Fec quickly vanished from sight around the curve of the trail while the others hid among a jumble of rocks, the debris thrown up from the canyon when the Spirit Dragon had slammed into the ground. "What's wrong?" Naiva asked. "Where do you think they went?" Grandmother touched her lips to command silence. She led the girls back the way they had come through the debris field, cut through here and there with stands of surviving trees. After about two hundred paces she showed them a nock cut into the trunk of an old juniper. Sliding sideways between the trees, they eased through the foliage and emerged onto a dried-up stream bed. They followed its descent for short ways, slipping and sliding on smooth stones. Grandmother halted beside a large rock half concealed by the thick branches of a medicinal plant called weeping berry. 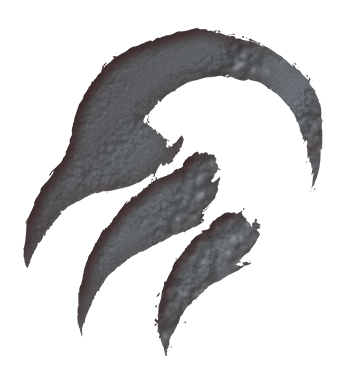 A mark had been carved into the rock: the "claw of Temur," now forbidden by Atarka. She brushed aside the hanging branches to reveal the narrow entrance to a tunnel. She tapped first Naiva's nose and then Baishya's, the old gesture she'd used to get their attention when they were toddlers. "This knowledge belongs to the whisperers, and to the elders. Never tell anyone else. Do you understand me?" Naiva frowned, both troubled and excited by the solemn words. "I understand." They walked single file, Grandmother leading, with Naiva at the rear. After some time, the passage took a sharp turn and they emerged into a circular pocket valley about one hundred paces across. The air within the valley was warm, almost balmy. Edible plants grew around a spring. The sky overhead was made small by the enveloping rocks, but the intense smell of growing things gave a richness to the tiny sanctuary. Baishya knelt by the spring. "It's beautiful. Look, here's chokeberry and stonebreaker, and twilight moss. How is it so summer-like?" "This is a sacred place, where shamans come to meditate. Now it is more than that, a sanctuary hidden from the dragons." "How can it be hidden from dragons?" Naiva asked, pointing to the sky. "A magic woven into the rock conceals it from above. But the magic can only span a short distance and must be renewed every year." "Why did you bring us here, Grandmother?" Baishya asked. "We could have stayed with the others while Fec scouted." Grandmother turned a slow circle, studying the little valley as if to make sure everything was as she'd left it. "If things go badly, if my worst fears are realized, you may need to shelter here." Four tidy mounds of polished agate marked the four directions. The stones radiated a heat that warmed the air. When Naiva picked one up, she discovered the gleam she'd taken for polishing was a glow of warmth. Baishya gasped, eyes widening with delight and amazement, and she too picked up a stone, pressed it to a cheek, then smiled as she cupped it in her palms. Grandmother touched two fingers to her lips for silence before gesturing toward a tunnel opening on the far side of the valley. They followed her quietly, their footfalls soft scuffs on the rocky ground as they moved as if into the bones of the earth. The rock enclosed them, protected them; the gleam from the stones lit their path. On the walls of the tunnel were painted the outlines of bison and saiga, of bears and wolves, of antlered deer and elk. Hunting parties surrounded young dragons, pinning them with nets as they turned their spears upon vulnerable bellies and eyes. 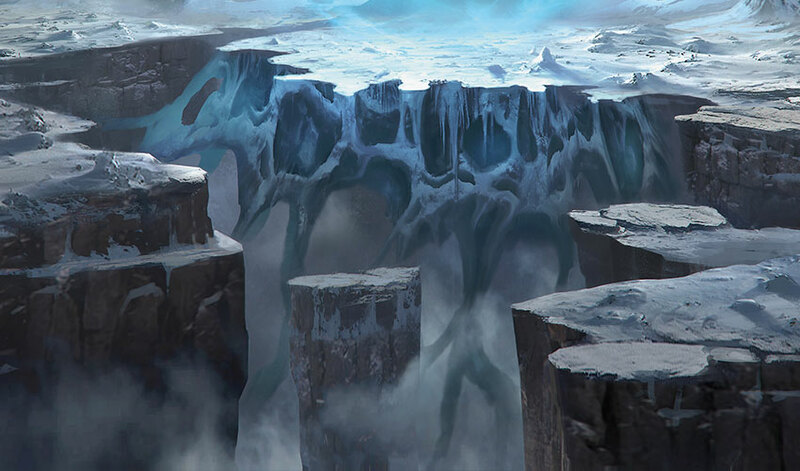 Amid the graceful paintings were carved the claw of Temur as well as other sigils—spirals and flames, spider webs and icy mountain peaks riven by crevasses—that Naiva had never seen before. Under other circumstances someone like her would never have seen this secret place. But she was twin to a shaman, and Grandmother never did anything for no reason. At length, the tunnel expanded into a long cavern, its walls so high the stone-light could not penetrate the upper darkness. Shapes greeted them like kinfolk silently awaiting their return. As they approached, the rounded shadows resolved into large headpieces resting on stone pillars. The oversized leather hoods were strung with carved bone, antlers, tusks, and amulets hammered out of bronze. Baishya stopped so abruptly that Naiva bumped into her. "What are these, Grandmother?" "They are the garb of a whisperer, as you are meant to be. We have hidden them here to save them from Atarka. The day you can no longer conceal yourself from Atarka is the day you will join the hidden ones, my child. We will have to hide you from her." "In a rock tomb, like our mother?" Naiva demanded. "Hush, not so loud, my brave hunter. You would have learned this in time, but now there is no time. Listen carefully, Naiva, for you have a part in this as well. You have the skill to be a great hunter, to support our people. But you have in you the chance to do something even more important than that." "What can be more important than feeding the clan and keeping Atarka fed so she doesn't kill us?" Naiva asked. "What is more important? To keep alive the knowledge of our true selves." Grandmother moved past them. Shelves had been carved directly into the stone. Here, set out in neat lines, rested a collection of horns, tusks, and antlers. The stone-light revealed carvings on their surface, their fine, elaborate lines clearly the work of master carvers. The light also revealed the way Grandmother's expression softened in a rare display of satisfaction. Few things in the harsh life they lived could ease her guardedness, but when she picked up one of the antlers and tipped it within the aura of light to consider the carving, she actually smiled. "These carvings tell the story of the past. As long as our ancestors live on through our memory of them, then there is hope we can one day reclaim who we are rather than serve only the hunger of Atarka and her children." "Are there stories of battles and dragon killing?" "Yes, and much more than that. It's past time for you girls to become guardians of this knowledge, so you can pass it on after I am gone." Naiva took the antler from Grandmother and examined the carving incised into the bone. No dragon killing, but dragons killing humans. All at once she realized it was the story of how the khans fell, a tale Grandmother often told hearthside at night both as warning and as reminder. Baishya hadn't even come over to look at the scrimshaw. She had drifted back to the headpieces, reaching out toward the closest one before trepidatiously withdrawing her hand. After taking in an unsteady breath for resolve, she reached again and this time cautiously brushed her fingers along the tokens of power. Her face settled into a look of awe. "I hear you," she whispered. Of course, the objects were whispering secrets to her. This tradition belonged to those granted the shaman's gifts; it didn't belong to hunters like Naiva. She was only here because of Baishya. Grandmother took the antler and set it back among the others. "Fec will have reached the camp by now. Come with me. Make no noise. Bring no light." They placed the stones on the ground and followed her into a wide tunnel, the only other outlet. The ceiling sloped down until they had to crawl. Fec's rumbling voice whispered around them, although his words were inaudible. After a pause, as if he was listening, he spoke again in apparent reply. Why was Grandmother spying instead of greeting her kinfolk in the normal manner? The passageway ended in a long horizontal cleft, too narrow to squeeze through, that overlooked the large, shallow cave. The stone hearth was covered in a fine, white ash. The packs and weapons of clan hunters lay scattered on the ground behind a stone wall high enough to keep out wandering beasts, but the hunters were gone. Fec stood at the entrance with the light behind him. He was looking toward someone at the back of the cave, their face and form obscured by shadows. Grandmother hissed softly between her teeth. A low-pitched voice spoke out of the shadows in a tone both sweet and melancholy. "An illness ate away their lives and brought them death. I am all that is left." "Who are you, kinswoman? Come out so I can see your face." "I dare not greet you, Brother, for fear of spreading the sickness that took the others." "I am not. But maybe the illness hides in me. Death can hide in many guises and strike when it is least expected, can it not?" Fec hid a hand behind his back and gave the sign for "caution"—which meant he knew about the hidden cleft and presumed that Grandmother was already there, watching. "How long ago did they die?" "I lost track of the days. Dreams trouble my nights. Do you know of any dreams?" "I do not dream." He held his hands out to show himself unarmed. "As I said before, I am called Fec, of the line of Abek, now fostered son to Yasova First Mother. Again I ask, may I know you and your family, Little Sister?" Silence filled the air like heat radiating off a fire. The shape took a step out of the darkness of the back of the cave, resolving into an exceedingly pregnant woman holding an axe. A fur hat was tugged down over her hair. It was hard to distinguish her features due to the way the shadows dappled her face. "Yasova First Mother," she said in that honey-sweet tone. "This name I know, but I do not know you, Fec, of the line of Abek. Bring me Yasova, and I will speak to her and tell her of what happened here. She will know about the dreams." "Is there anything you need, Little Sister? Anything you need until I return?" "I have what I need." She rested a hand on the spread of her belly, as if in reminder that every child birthed was a child set upon the path of the clan, a link between the past and the unwritten that has not yet come to pass. "Your first child. You look near your time, and there is no midwife or healer here." "Yes, yes, all is well. The time is near. Where is Yasova?" He tapped his chest with an open hand as if in acknowledgement of her words, but it was really a signal to Grandmother that they would meet back with the others. "I will see what I can do, Little Sister. Although it may take some time. Wait here in peace until I return." She said nothing, just waited. He retreated without ever turning his back on her and finally vanished into the daylight. Only then did she return to the shadows. A darkness curled around her, hiding all but a gleam of eyes. Without speaking Naiva crept backward with Grandmother and Baishya until they reached the cavern where the headpieces rested like presences waiting to be released from confinement. Grandmother handed each girl a stone. Her expression was grave. "You are most precious to me, my girls." The shock of her saying this out loud robbed Naiva of breath. For an instant, she thought all the air had been sucked out of the chamber and she would suffocate. Always attune to her twin's emotions, Baishya grabbed her hand and squeezed it. "We are come to a time of great danger. Those of us who remember what once was are passing into the ice of the ancestors, while those who will be born will never know who we once were except through stories they are told by people who never witnessed what they tell of. You are all that remains of my daughter, whom I loved. But you are also my offering to the unwritten now, you and the carvings we make to tell our story so others may know of us in distant days to come." "What's wrong?" Naiva demanded. "Do you think the woman's sickness will infect us?" "Did you not recognize her?" Baishya said, "It was hard to see her face but I thought she looked like Mevra." "Yes, the body resembles Mevra, but I believe the speaker is not what she seems." "Are you saying someone has stolen Mevra's shape? How can anyone do that?" Naiva asked. "My healing magic is powerful. There are other forms of powerful magic in the world." "Like Baishya moving stone and ice." "That's right. Maybe magic can mold a person into a different form. Maybe it merely makes us believe through illusion that we see something that isn't there. I don't know. But Fec's sense of smell is excellent, and by his sign, he also suspects it is not her. I cannot be sure until I approach more closely and question this person myself. I'm leaving you two here while I do that." "I'm not afraid," said Naiva stoutly. "Of course you aren't." Grandmother grasped a hand of each girl, holding tightly. "But until I figure out why Ugin has sent visions to us now, or if they are even Ugin's visions, you two must stay here." "Who else's visions could they be?" "An interloper who has already infected us by bringing about the reign of the dragonlords. If anything happens to me and the others, wait a month." "Do as I say. After a month, return to Ayagor and tell Gerrak he is now First Father of the tribe." Without further explanation, she left them. "What interloper?" Naiva stared into the darkness left by Grandmother's departure. "How could one interloper have brought about the reign of the dragonlords? Aren't dragons always fated to rule us?" "A rope is not a single strand but many strands woven together," said Baishya softly. "The future is like that rope. The strand we are on now is not the only strand that could have been. There was a different path, one that wasn't taken." "You sound like a whisperer now!" "I am a whisperer. Don't you remember the tale, Nai? There was another great dragon in the storm that day, the one who killed Ugin. He came from nowhere and vanished to nowhere." "Does Grandmother think he's returned?" Naiva hugged her arms around herself. It suddenly seemed so cold. "She can't face a dragon alone. We should go back to the overlook and see—"
"No!" Baishya's usually mild, hesitant tone hardened, making her sound like another person, not the shy, dreamy twin Naiva knew so well in some ways and yet whose mind was so different from her own that it often baffled her. "We can't go back there, Nai. I know where we have to go." She tugged Naiva into the darkest corner of the cavern. The stone-light revealed a cleft so narrow that Baishya had already taken off her pack and set it down in order to squeeze through. "What are you doing, Bai? Grandmother told us to stay here." 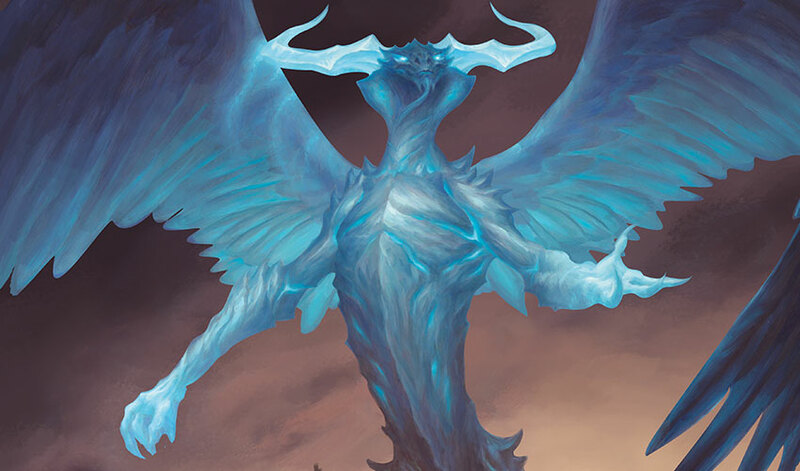 "Ugin is calling me. I didn't hear it before. Maybe we were too far away and it can only reach me through the magic woven into the headpieces." 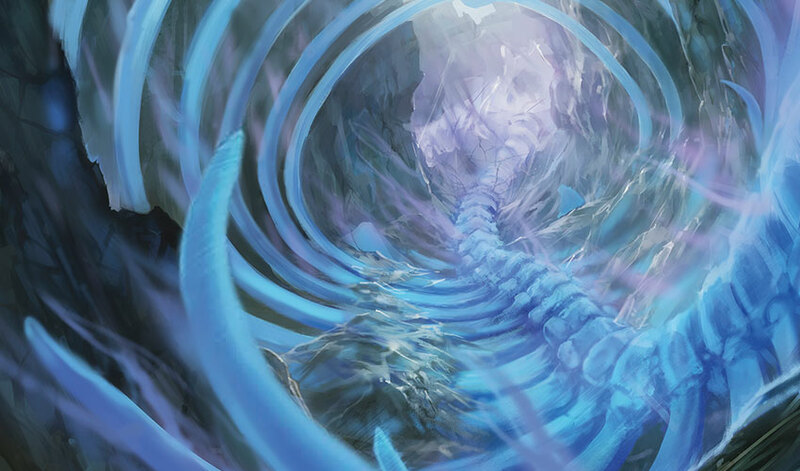 "Ugin is dead. Dead things are dead." "No. Death is more complicated than that. If you won't come, I'm going alone." She'd said the same words when she set out to climb Eternal Ice. A part of Naiva wanted to balk, to turn away. But just as on the day Baishya had set out up the sacred mountain, Naiva knew her twin had her mind set on a path and would not turn back. Since it was her duty to protect Baishya, she set down her pack and, still holding the stone, turned sideways and followed her into the cleft. She scraped her nose on rock as she side-stepped along. The back of her head bumped against the other wall. After one hundred and eleven side steps the cleft widened enough that she could cram up beside her twin. Bai was breathing hard, coughing a little. Naiva draped an arm over her shoulders. "Look, there's a glimmer of daylight ahead. We'll set the stones down here so we can get them when we come back." The cleft opened into a shallow cave where a ring of stones formed a fire pit. It hadn't been used for a long time, all the ash blown away, and Naiva saw no sign of stockpiled fuel. They found a track, a switchback down the steep canyon face. The sun wasn't yet at zenith, and shadows filled the canyon, so they walked with care for where they set their feet. The track wasn't more than a hand's span across. 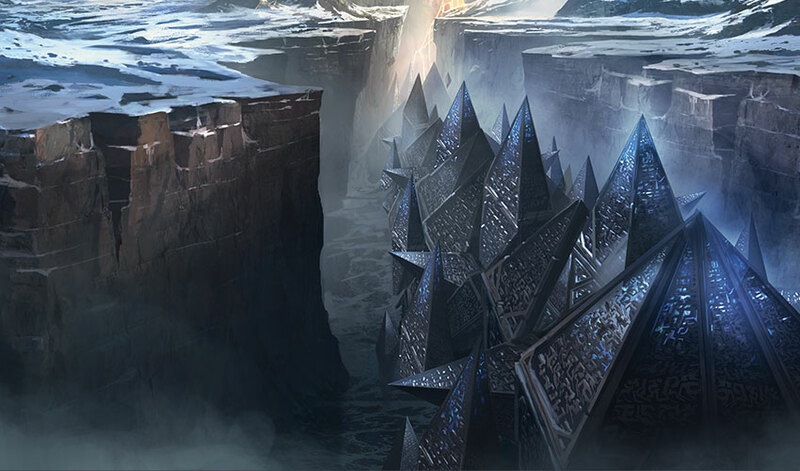 It would be easy to tumble down onto the ice-ridden spikes of the hedrons. The noise of the wind fell away as they descended, drowning them in a dense hush like their ears were stuffed with cloth. A deep, soundless vibration hummed up through the soles of their boots in a slow rhythm that reminded Naiva of breathing, not that there was anything alive down here except the two girls. Not even birds flew. When she licked her lips, the air almost seemed to spark on her tongue, as if they were walking into an invisible sheet of frozen lightning. At last the trail bottomed out, catching them in a dead end. Angled hedron walls confined them. There was nowhere to go except back up the track. Her twin had led her into a dead end, as always. The thought crept stealthily into Naiva's mind. She always had to follow the path Grandmother set out for Baishya instead of commanding the glory due to her for her hunting prowess. She deserved more. "What?" Startled, Naiva turned to see Baishya watching her through narrowed eyes. "There was just something funny about your eyes but it's gone. Look here what I've found." She fixed a hand around a lower corner of one of the hedrons. As if it were a dragon's scale come loose, she shifted a slate-like slab of rock to reveal an opening big enough to crawl through. Baishya dropped to her knees and crawled in. Her feet vanished. The ground thrummed, then quieted. Naiva prided herself on her courage. The sight of that gap into a murky darkness no light could penetrate struck a blade of terror into her heart. Coward! All her life she'd been reminded over and over that she was to protect her twin. For so long she'd thought it was because Baishya was weaker, frailer, less competent, maybe a person who the tribe would decide wasn't worth feeding. But it wasn't like that at all. Grandmother loves her better than she loves you. You can leave her. No one will miss her, and then Grandmother will love you more. The thought nagged. She took a step away, toward the track. Another step. You have a greater destiny. You will become the most magnificent hunter known to your people. It will be easy, once you no longer have her to burden you. But duty and love rooted her feet. It was impossible to walk away and leave her twin behind. They had been born together, pulled from the bloody womb of their dead mother, hand clasped to hand. To betray that bond was to betray her own self. So she knelt and ducked inside the hedron. A gleaming mist drifted before her eyes, obscuring her vision. Colors twisted like threads, shimmering, dizzying. The space was vast, immeasurable, the heady breath of eternity sweet against her face. The space was as small as a skin tent raised against the snow in midwinter, cramped and humid. Baishya lay sprawled across the ground as if asleep, one hand limp at her side and the other extended above her head to grasp an object Naiva could not see. The air clotted in Naiva's lungs. She fell forward as her vision hazed. With her last conscious breath, she clasped her twin's hand, skin to skin. The magic of the hedrons opened a gate mind to mind. The Spirit Dragon's essence rose like a cliff of ice around her, glittering and impassable. She fell into the vision where Baishya had already plunged. The landscape is a silvery sheet of water as flat and reflective as a mirror extending to the horizon on all sides. Here and there rocky islands like spires rise from the endless sea, each creating a perfect resting place on which to meditate. "What is this place?" the dragon says and, hearing his own voice, lashes his tail in surprise. But the lashing tail stirs no wind. The waters do not ripple. Only the reflection moves as the dragon answers itself. "This must be one of the planes of which Te Ju Ki speaks. I have walked between worlds . . ."
The realization sparks a billow of shimmering, lightless flame that seems to enfold the dragon, and just like that it vanishes. The water waits motionless, calm, and yet expectant, almost aware. Another globe spins up to the shadow of the sleeping girl, and pops. The dragon falls in confusion, opening its wings at the last moment to settle atop a jagged peak. But this is not its smooth-sloped birth mountain presiding over a magnificent, rich landscape. 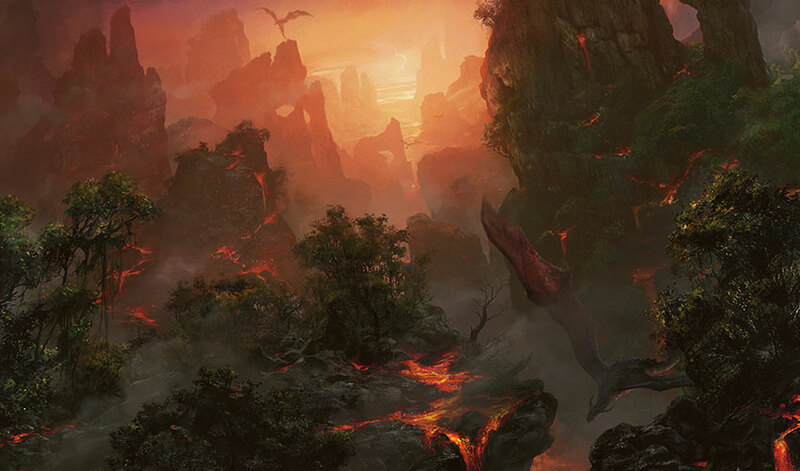 This is a wild, stormy, rugged world only half born, called Tarkir. Ferocious winds greet the dragon in savage gusts. The mountains sing, spilling arias of fiery lava, and the rivers gush in a rushing chatter of delight. The hearts of the dragon feel touched as by home. This wilderness can be tended, not to create the garden of his desires but to become itself, to fulfill the promise of its nascent soul. So, he burrows into the soil and digs out the creatures of earth. He swims in the churning rivers and restless seas and heavy mires, and each foamy ripple boils a myriad of creatures into the waters. The beat of his wings cracks thunder and lightning through the sky, and this tempest births dragons. Even fire begets living things, splendid in their heat and beauty. Or at least, this is a story the humanoids often tell as they weave tales about the most ancient of days, for those who witness the dragon's majesty and power cannot help but wish to be associated with its grandeur. As a knowledge of magic arises among the various peoples, shamans seek the dragon's tutelage. To the wisest, he relates the story of the journey that brought him to Tarkir. In telling the tale, he discovers that the worst edge of the shock and betrayal have worn off. What has happened to his twin? Has Nicol survived? What of their birth plane? If he could walk the planes once, surely, he can do so again. He seeks in his mind for the spark that opens the way between worlds. In a wash of invisible, rippling flame, he shifts through a blind, disorienting darkness and, after a moment of stomach-churning unpleasantness, finds himself again floating above the still waters and their mysterious aura of meditative peace. He stares at his perfect image staring back at himself. A single drop of water falls from the lambent sky, or perhaps from his own eye, and strikes the water. The ripple of its passage opens a vista. Through this window, he sees the birth mountain, still proud, still snow-capped, but marred now by an unsightly growth. Like an unvoiced roar of anguish, all the thick, clotted emotion he thought he had left behind swells up in a fierce surge. The spark gives him passage; he twists through shadow, and then he is there, falling out of the sky toward the birth mountain. He pulls up onto a mighty current of wind and circles the mountain, cycling lower and lower until he sees that someone has built a temple atop the mountain. This structure is a gaudy spectacle of tiered roofs painted red like blood and topped by two huge horns curving in on each other. Robed priests come running, seeing him, and they ring bells and hammer on drums. Some prostrate themselves as if in worship, while others weave magic and fling it at him like a net meant to capture and drag him down. He evades these crude displays of magic and flies down the mountain, seeking anything familiar. The clearing where Merrevia Sal was killed, where the old chief built his temple, is now the central square of a grand city that sprawls down the skirts of the mountain to reach all the way to where the old settlement once stood. So many humanoids tread the city's streets that he cannot count them. Their voices rush like the chatter of boundless rivers, but beneath the bustle and liveliness dwells a tainted stillness. A festering darkness paves the alleyways and tenements and insinuates itself into every transaction. Beneath the prosperity of those who wear a badge sewn with curved horns, of those who feast at grand tables and serve in opulent temples, of those who carry iron swords and spears as they swagger about their business, creep the shackled and the starving, the slave and the shunned. This place looks little different at root than the old blood-soaked settlement of the dragon-killing chief, just grown and metastasized. But he knows in his hearts who rules here. He recognizes the shape of the curved horns. He betrays me still, the promises we made, the bond we shared. With a howl of frustration, of rage, of grief, he vanishes in a ripple of invisible fire. After a gut-twisting passage through the blind darkness, he emerges again above the dreaming mirror. The calm waters soothe his troubled heart. The cursed lash of emotion eases. For years uncounted, he hovers above the waters, lost in thought and lost to ego's purpose. The world on which he first fell to earth—Dominaria—is but one among many. Why weight himself with the past when an entire universe of worlds awaits exploration? He is not confined to the birth mountain or even to Tarkir, his soul's home. The universe is greater than he is, and that is as it should be. A new peace settles into his hearts. With elation, with joy, with purpose, with tranquility, he launches himself in a ripple of invisible flame. He walks the planes, wonders and dangers unfolding as he crosses from plane to plane. Tumultuous Zendikar. Moon-haunted Innistrad. Sun-drenched Lorwyn. Sturdy Alara with its mana in perfect balance. Shandalar's verdant flow of magic. And so many more, some vast and saturated with mana, some attenuated shards leached of life and magic both. Did even Te Ju Ki suspect how manifold the universe is? The grandeur of the Multiverse awes him; its magnitude humbles him. Yet again and again his thoughts circle back to his twin. He has avoided Dominaria all this time, feeling trapped and diminished in the confines of his past. Maybe he is too quick to be suspicious of Nicol, who after all was a very young dragon and prone, as youth is, to impulsive mistakes. Maybe he misinterpreted the curved horns and what they mean. He suffers from pride too, like his twin, unable to let go of a past injury. He might have seen what he wanted to see rather than explored more fully to find out the truth. Surely, truth is more important than pride, more satisfying than power. He will find Nicol, and it will all go back to what it once was between them. He's sure of it. By now, he has mastered planeswalking. In the blink of an eye, and with a ripple of invisible flame, he is gone. Banners rippling in the wind, Armies march across the plains of Jamuraa. In their wake spreads the wreckage of a great war: broken bodies, ruined cities, and lands poisoned by battles waged through merciless sorcery and the shattering might of dragons. Here and there, flags marked with the crown of Arcades Sabboth lie crushed in the dirt and mud where cohorts have fallen to a pursuing army. Standards bearing the curved horns advance until the proud survivors of the fleeing army gather and brace for one final engagement. The last great clash opens with the howls of soldiers driven to madness by generations of war. Claps of sorcerous thunder burst the hearts of the enemy. Ugin stares in horror as lesser dragons, unknown to him, fight and fall in the first charge. Arcades Sabboth commands with brilliance, flying this way and that to fend off a flanking maneuver here and an assault of sorcery there. But always Nicol is there to counter him, ceaselessly patrolling the lines of battle as companies of soldiers and sorcerers vie for the honor of fighting in the front line where he can see them. Both are so intent on the battle that they don't notice him, high above them in the sky. In a flash of anger, and of shame at himself for staying away for so long, the dragon furls his wings and dives. On his travels, he has learned sorcery to shield himself against spears of iron and nets of deadly magic, so he hurls himself between the two armies and spreads his wings in a shimmer of invisible flame to hang there between them like an apparition. The shocked troops pull back. Even his warring siblings are astonished enough by his unexpected appearance to break off the fight. Now that he has their attention the dragon roars. "Nicol! Arcades! You must put a stop to this! It's wrong!" "I fight only to protect my people!" Arcades answers in a furious bellow. But he is canny, and notices at once that Nicol's attention has fallen away from him and his army and onto the interloper. As the dragon hovers between them, Arcades whips the remnants of his ragged army into a full-scale retreat. The line of the other army awaits its orders. Nicol gazes in shock upon the revenant that confronts him. "What sorcery is this?" he demands. "Ugin is dead." "This is some cursed magic wielded by Arcades!" He surges forward and, with a blast of fire, attempts to obliterate the mirage. But Ugin's magic is powerful, knit from all of magic's spectrum. Nicol's rage streams harmlessly off to dissipate in the air. The terrified army holds its ground, even those struck by burning sparks who writhe in torment as they fall. "You're dead. I saw you annihilated by a vile burst of human sorcery. It was their revenge for my victory, destroying what I love most. But I avenged you. I set out to make the world worthy of your vision of peace and harmony." His words are so heartfelt. Yet he abandons his soldiers, leaving them to pick up their dead and wounded. Scouts from Arcades's retreating army ride to report on this abrupt change of circumstances, how the victor has relinquished his advantage on the field. But Ugin cannot stay to see what Arcades means to do, much less spare an hour or a day to talk to his older brother, to ask what has happened in the years or centuries since he left. He came to find Nicol, so he follows his twin. They fly across the plains and mountains of Jamuraa and thence across the ocean, passing over other islands and continents. 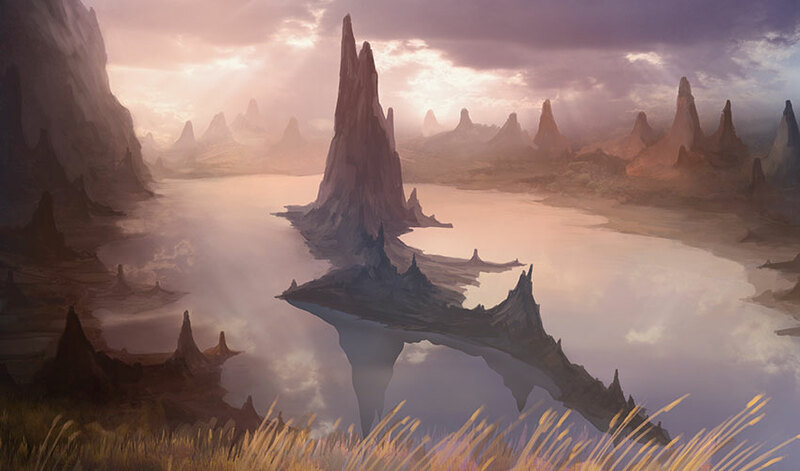 Dominaria is beautiful, wrought with cascading waterfalls and splendid mountain ranges, lush pastures and flourishing forests that breathe life into the air, colorful reefs and sparkling sand-strewn islands. But amid the striking landscape nestles the residue of war: blighted fields, scorched villages, scattered bones. Even the land has been warped by dire magic wielded without thought for its consequences: rivers blocked until the waters flood hapless settlements, canyons gouged through peaceful plains, avalanches burying quiet valleys. Nicol surveys the landscape with a satisfied smile, seeming not to notice any of this horrifying destruction. "Did you ever suspect the world is so vast a place, Ugin? I have traveled everywhere, no place too small or too grand that I have not set claw upon it. Half of it I now rule, as I have risen from least to greatest. All of Dominaria will soon kneel before me. No one dares call me "least" now. And you are returned to share this triumph with me." At last they reach the continent of their birth, and the birth mountain. The crater's peak is bare except for a pair of curved horns crafted from marble, making it seem the mountain itself has horns. "Was there not a temple built here?" Ugin asks. "There was, a long time ago, but I realized it wasn't fitting for humanoids to set their feet atop sacred ground meant only for dragons. Only for me." He lands gracefully, leaving room for Ugin to settle beside him. "For you as well. I missed you so much, Ugin. My anguish crushed me. I thought of you every day, wondering what had become of you and how you were faring. So, tell me, how do you like my domain?" Ugin is silent for so long that at length, Nicol, lost in contemplation of his magnificence, realizes he has not answered. "Share your thoughts with me, Brother. Is it not remarkable what I have achieved? Even you must admit no creature has ever held so much power over so many as I do." The words spill out like fire. "You tried to influence me with that trick of the mind. How could you, Nicol? Bad enough that you worked such a terrible magic upon others but on me, your twin!" "You disliked the 'trick' never so much as when it worked against you." Nicol chuckles softly. "I was young, and testing my power. But now I have no need of such insecurities. I am emperor of all, or will be soon." "All? You think this is all?" Ugin laughs, his belly churning with an anger he does not understand. Nicol huffs, head slewing around to glare at him. "Why do you laugh? Power is nothing to mock." "This is but one shard of a myriad shards. Not insignificant to those who live and die here, of course. 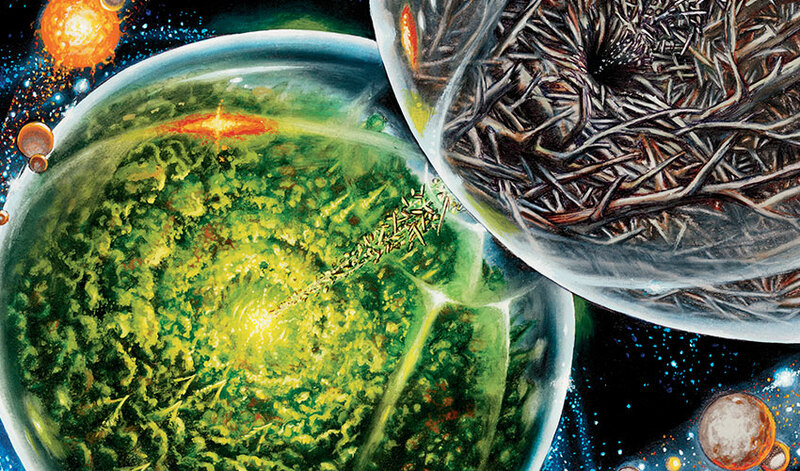 But compared to the Multiverse that lies beyond, it is like claiming this mountain as the entire world when it is but a tiny fragment of the whole." "I'm talking about what Te Ju Ki taught me—"
"That old human is long vanquished by death and her prattling wisdom nothing more than dust. While you and I are still here." "If that is what you think then you do not understand death or wisdom. I thought there was more to you than this, Nicol. Do you really believe this petty warmongering and conquest means anything in the vast reaches of the universe?" Sparks puff from Nicol's nostrils. A sulphurous wisp of smoke hisses from his mouth. But for a long, long while, he remains silent. The wind skirls atop the mountain. Snow starts to fall. The flakes that land on the dragons' scaly hides vaporize instantly. Water drips onto the rock, puddling and then freezing. Far below, snow drapes the surrounding landscape in winter's mantle. Ugin does not remember it ever growing so cold here, but the balmy climate has clearly changed. Even the once great city has seemingly dissolved, overtaken by forest that has wrapped itself around crumbling towers and uprooted noble avenues. In the distance, a ring of fortresses protect all approaches to the base of the mountain. Beyond these outposts lie temples capped with horns, and beyond the temples lie towns too far away to be seen except by dragon eyes. But every fortress and temple and town faces inward toward the mountain, as if all that matters to Nicol anymore is that every face is turned toward him to praise him. Nicol speaks in a contemplatively wistful voice. "Have you returned only to insult me? I thought we were twins, not rivals!" Beguiled by the words, Ugin softens. "Of course we are twins, not rivals. Our bond, our brotherhood, is the only reason I returned to find you. If I hadn't come back, I would be discovering all the wonders that lie beyond this small world." Nicol's eyes narrow with a look of alarming inquisitiveness. "Where have you been? If it wasn't a sorcerous spell that caused you to vanish right before my eyes in a ripple of magic, then what happened to you?" "I am a Planeswalker now." Nicol stares at him, eyes gleaming. "I am not even sure there is another like me. I have found no trace of any other creature who can walk between worlds." Nicol blinks but says nothing. "I don't know why, or how, it happened. Only that I was on Dominaria, facing you, and then, suddenly, I was flung beyond this plane. It shocked me at the time. I was bewildered and confused. But I have since discovered there are many planes, many worlds. They are linked by a shadowy space, a web of darkness to which everything attaches. By moving in and out through the web, I can pass from one world to another. Such wonders I have seen! A hundred worlds I have visited. To rule Dominaria is all very well for a small-minded despot like that old chief who killed our injured sister and believed it made him divine and invincible. But he and his squalid heirs were nothing more than negligible tyrants compared to the eternity and infinity of—"
"Are you comparing me to those pathetic, weak, short-lived humans who I destroyed with the most superficial flicker of my mind?" The words emerge in the barest whisper. "When I look at what you have wrought with these pointless wars against our dragon brethren? Hear you boast of it as a puny child might brag of killing a fly by saying they have killed a mighty dragon? Yes, I do compare you to such pathetic creatures. For at least they do not know better. You should know better." "How long have you known how to do this?" "Since that day. The day you tried to manipulate my thoughts." "That day happened four or five thousand years ago as humanoids measure time. And you never thought to return until now? Never said to yourself, I must share this momentous revelation of planeswalking with my brother, my twin?" "How could I trust you? You tried to manipulate me—"
"Show me how to walk the planes. Take me with you." Eagerly Ugin begins. "You focus your will upon the spark inside you and . . ."
He breaks off. It was a spark born inside him that gave him the capacity to planeswalk. Without the spark, the paths between worlds are simply a closed door. "You can't tell me, can you?" sneers Nicol. "It's all a lie, isn't it? You've been hiding all this time in a coward's sanctuary. Now when I have almost conquered the world—the only world there is—you return like a hungry rat hoping to steal my glory and claim it for yourself." "Of course I don't believe you. You are a liar. You have always been a coward and a liar. This is the greatest lie of all, born deep in your frightened, envious heart that I have accomplished all the things you've never had the courage or the strength of will to bring about. It was always about me, wasn't it, Ugin?" "You can only see yourself in everything that happens. What happened to you?" "Nothing happened to me. I am as I have always been." "Yes, maybe that's true. Maybe all along it is I who have been lying to myself, thinking you were better." "The lie is that you have all along believed you were better than me. You're the manipulator, Ugin. Not me. I have only ever done what I needed to help us survive. I have only ever kept faith with you and with our murdered sister. What have you done except cravenly hide away, abandoning me? You only came crawling back when I had done all the hard work of making the world safe for us." "You are right. I should never have come back. So be it. Enjoy your ascendancy over Dominaria. It's all you'll ever know, while untold worlds lie forever beyond your reach." 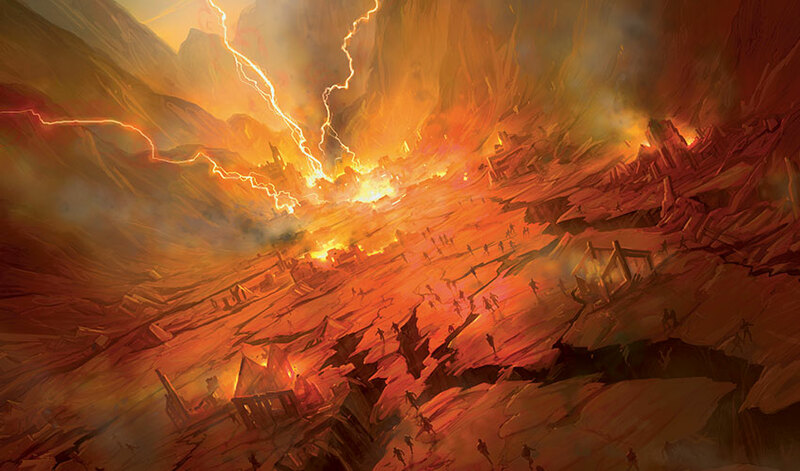 Enraged, furious, heartbroken, Ugin vanishes in a ripple of invisible fire. A jolt rolled Naiva off her side. As her back hit the cold wall of the hedron, she opened her eyes in shock. Her hand had lost hold of Baishya's fingers, the contact broken. Her twin still breathed, chest rising and falling in slow swells. Beneath the closed eyelids her eyes moved restlessly, darting as if trying to take in an endless stream of sights. Was she caught in memories, or in false dreams? Was what they were seeing real, or an illusion? A hunter trusted the evidence in front of her eyes: the imprint of hooves or paws, broken grass revealing a trail, the smells on the ground and in the air, the rustling of a beast's passage or its vocalizations marking its position. How could anyone trust stories handed down from the ancient past or dreams bubbling up from an unknown source? What if it was all lies? A scuff sounded from outside, following by a slide of pebbles on the path. She ducked her head out the small opening to see her Grandmother hastening down the switchback path. Scrambling out, she grabbed her spear. "Grandmother." She kept her voice low, glancing nervously up at the sky, although she could not have said why, just that she felt a prickling on her back, a bristling along her neck, as if the hunter was being hunted by a predator much larger and more deadly than any human. "Naiva!" Grandmother set a firm hand on her shoulder, shaking her with a rare display of concern. "Why did you two leave the safety of the cavern? Where is Baishya?" Naiva indicated the low opening and murky interior. "I tried to stop her, but you know how she is. The Spirit Dragon lured her down here and has trapped her in a strange realm of wide water, like a mirror." "I followed her inside. When I took hold of her hand, I fell asleep too. I saw what she saw, dreams that felt like memories. Then I rolled over and the contact between us broke, and I woke up. But she's still sleeping. It's as if she can't stop." "The Spirit Dragon is trying to speak to us." "You keep saying that, but the ancestors never truly leave us unless we discard our memory of them. What did you see?" Naiva was no storyteller. Instead, like a hunter, she efficiently described the strange landscape and the floating bubbles. Grandmother listened closely and, after Naiva was done, stood in silence, her expression as focused as if she were hunting through the words for the secret she was looking for. At last, Naiva could take her silence no longer and broke in. "But what does it all mean? Why is this all happening?" "It seems Ugin is not dead after all. But not awake either. I must conclude the Spirit Dragon is trying to communicate to us in the only way he can, as the ancestors sometimes do through dreams and visions. The windfolk are more deeply attuned to the winds of magic, so he sent them a vision out of the depths of his sleep. They called Baishya to him, knowing her for a whisperer who can speak mind to mind." She paused. "As you and I cannot, Naiva. That is not a lack in you and me. It just means Baishya has her own path in life." "To pass on a vision to you telling you to come to this grave?" "Perhaps. Tae Jin's master must be a powerful shaman. Thus, he too can receive a vision, and thus, Tae Jin is sent to me in order to tell me the story Ugin told the Jeskai long ago. That story must be important as part of what the Spirit Dragon wants me to know. But what am I to learn from all these hints and landmarks? What does Ugin want me to see?" "What if it's all lies, Grandmother? Dreams can be lies. Old stories can be lies." Grandmother grabbed her chin and forced her to look at her, staring into her eyes as she searchingly examined her face. "Your pupils look normal. Do you hear a whispering in your head?" "What do you mean? No! What do you think is happening?" "Mevra and the others are almost certainly dead. What has taken Mevra's form I do not know, but if what I suspect is true, then we are in terrible danger." The flat way Grandmother spoke sent a shiver of fear through Naiva's flesh, a worm of cold that nipped at her heart and made her feel faint. "What danger? Where are the others?" "Hiding in the sacred cavern. You must go up to join them." "I'm not sure," said Grandmother. The three words were the most frightening thing Naiva had heard in all her life, because Grandmother always knew what to do. 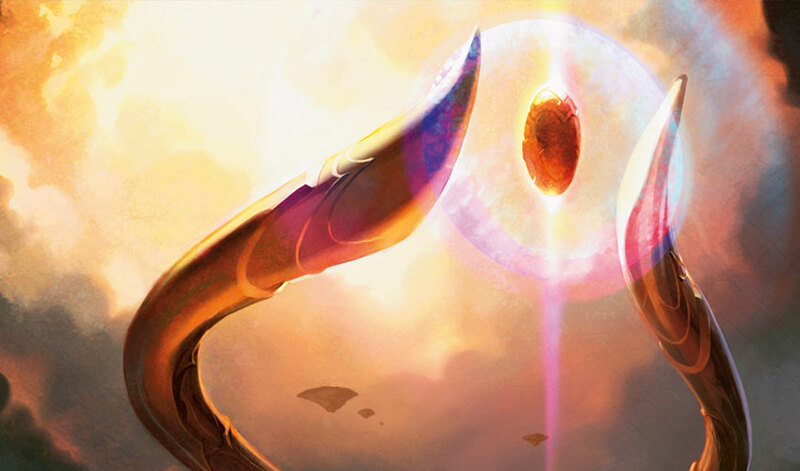 "What warning the Spirit Dragon is trying to give us may have come too late, but I must see if I can communicate with Ugin myself to find out what he wants. If what you say is true, maybe I can reach his dreams through Baishya." A crack of noise brought her head up. Both of them stared at the canyon's rim, high above, and rising beyond it the glossy blue glamor of the cloudless sky. The sun stood at zenith. Nothing moved, not even a bird or an insect. "My sweet child," Grandmother said in a low voice ragged with unexpected emotion. She kissed her on either cheek. "Go quickly. Go quietly. Do you understand me? Let nothing distract you." She crawled in through the tiny opening, disappearing inside the hedron structure. A tremble shivered the ground beneath Naiva's feet like the tremor from a distant earthquake or the shudder of a creature rolling over deep underground. A rush of fear spilled adrenalin through her muscles until she shook. Biting her lip, she breathed down the wave of terror, but she couldn't help thinking of the two people she loved most in the world lying asleep and unaware, utterly helpless. She set the broken piece of crystal back across the opening to conceal it but without fixing it in place so it would be easy to dislodge from the inside. After taking ten steps up the path she looked back. From this distance, the hedron surface looked so smooth and unbroken she was abruptly afraid she had accidentally trapped them, that they would struggle to break free only to find themselves in a prison of her making. What if they died of thirst alongside the Spirit Dragon's bones? She would just go back and check one more time. . . .
Movement flashed in the periphery of her vision. She whirled, pointing her spear toward the path. A woman emerged from behind a ridge of rock, negotiating the last switchback before the path took a straight line down to the base of the canyon. She was hugely pregnant but remarkably light on her feet, strong and graceful, not lumbering at all. Naiva knew her at once. Mevra's face was a familiar sight at the yearly gathering at Ayagor when the various hunting parties and family groups were required to present themselves to Atarka. She was related to Grandmother through grandmothers who were sisters, and for her own part was also a hunt leader, intelligent and level-headed, one of the few people Grandmother genuinely respected. Mevra's face smiled, seeing Naiva. It was such a friendly, pleasant smile, so reassuring. "Greetings, Little Sister. I've come so far to find you and your family, and to discover some family of my own." "Who are you?" Fear snapped in her voice and surged through her flesh, although she could not have said why. "Don't we know each other? What is your name and family?" Naiva's mouth opened before she knew she meant to speak. The words just flowed out. "I am Naiva, daughter of Kiarka, daughter of Yasova." "Yasova! Why, it is Yasova I seek. Is she not here? Did I not see her descending toward this place?" "There is nothing here, as you see" Naiva concentrated on moving her right foot, anything to get away, but the foot would not shift. A sick terror clawed up through her gut, and she breathed it down until she could speak comprehensible words. "Nothing but these hedrons, covering the bones of a dragon who died a long time ago." "Not so long ago. A moment. A breath." "My whole life ago," said Naiva. "Ah, you are very young, a mere fledging." By now Naiva's breath was coming in gasps, as if she'd been running and could not stop, and yet she had not moved at all. The pregnant woman wearing Mevra's face descended lower and lower, coming closer and closer. Her hunter's training raised every alarm: the woman had no smell of felt or sweat, no glisten of oil on her uncovered cheeks. The wind did not stir any loose strands of her black hair. Her steps made no noise, not even the slightest scuff. Her feet weren't touching the ground, a finger's breadth gap between the soles of her boots and the rough dirt. What had Grandmother said? Illusion may make us see what is not there. "Who are you?" Naiva repeated recklessly, her hands grimly clutching the haft as she leveled her spear at the woman, who was still descending with that eerie glide. "You aren't Mevra. You're no kin of mine." The pregnant woman halted. She blinked in a long slow lowering and raising of eyelids that seemed to turn the day to dusk. Then she smiled, a little too widely, a little too brightly, a little too warmly. "A wise fledgling, to be so observant. Where is Yasova?" "Not here, as you can see for yourself," said Naiva stoutly, although she felt dizzy with the effort of staying upright. "Who are you? You're not Mevra. Your feet aren't even touching the ground." The pregnant woman's laughter filled the canyon, echoing off its high walls until Naiva fell to her knees and, dropping her spear, clapped her hands over her ears. The laughter cracked as the woman's smile widened, curling back around her head, mouth splitting as if cut by a blade to expose her throat, lips peeling away to consume her head and then her shoulders and then she turned inside out in a horrific distortion of birth. But what emerged from the melting body of the woman twisted and stretched, growing as voraciously as if this new being wished to consume the very heavens. A dragon unfolded out of the illusion, so magnificent a creature that the memory of Atarka's might seemed paltry in comparison. He was so big he blocked the sun, allowing its light to limn his form on either side so he shone. Rainbows refracted around him, spilling arcs of color across the sky as if in celebration of his arrival. In shock Naiva stared up at the curved horns familiar to her from the strange memories she'd shared inside the hedron. A gleaming, egg-shaped gem floated between the horns, turning slowly, mesmerizing. "All will be well now," said the dragon in his soft, beguiling voice. "You are safe now, little Naiva. All your troubles will be solved. Everything you have always wanted will become yours for as long as you live. Trust me. I just need one thing. One little thing." Never would she bow. Never would she cringe. Never. "What do you want?" "That's what I thought the first time I killed him, but he wasn't dead after all. This time I've returned to make sure of it. You are the indomitable hunter, soon to be renowned as the mightiest of all dragon killers, who is going to help me destroy him for all eternity."